Castaway Play Cafe’s Newest attraction! 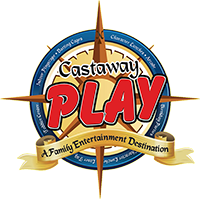 Are you ready for the ultimate challenge at Castaway Play Cafe? Fall into our zero shock air bags using our trampoline, zip line and trapeze. Finish the course on a 10′ or 12′ warp wall and hit the buzzer to complete the course…Are you be fast enough to get THE BEST TIME?! Golf… and so many more! Test out your climbing skills with our two story rock wall, featuring three levels of expertise.